This species possesses a unique fleshy structure on the lower lip. lineatus: from the Latin lineatus, meaning ‘lined’. Native to Penisular Malaysia plus the islands of Sumatra (Indonesia) and Borneo (Malaysia, Indonesia, and Brunei Darussalam) with type locality ‘Muar River at Tubing Tinggi, Johor, Malaysia’. In Peninsular Malaysia it’s been collected in the states of Johor (Muar River) and Pahang (Lake Tasik Bera). In Sumatra there exist records from the province of Jambi (Batang Hari River) and on Borneo in the Malaysian state of Sarawak, Indonesian province of Kalimantan Barat/West Kalimantan (Kapuas River), and throughout Brunei Darussalam. An ideal addition to a peaceful community of Southeast Asian fishes such as similarly sized cyprinids, cobitids and certain anabantoids. Some of the more commonly exported species from Borneo include ‘Puntius‘ johorensis, ‘P.‘ pentazona, Brevibora dorsiocellata, Trigonopoma pauciperforatum, T. gracile, and several Pangio spp. Maintaining it in decent numbers will not only make the fish less skittish but result in a more effective, natural-looking display, plus males will also display their best colours as they compete with one other for female attention. One of four similar-looking, laterally-striped ‘Puntius‘ spp. native to Southeastern Asia alongside ‘P.‘ gemellus, ‘P.‘ johorensis, and ‘P.‘ trifasciatus. 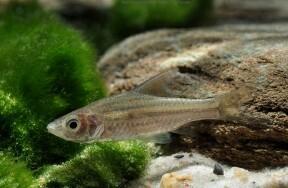 Of these ‘P.‘ lineatus is most often confused with ‘P.‘ johorensis by virtue of the fact that these two seem most common in the aquarium trade. Telling them apart is relatively simple since ‘P.‘ lineatus has 0 – 1 pairs of barbels (vs. 2 pairs in the other three species), juvenile colour pattern does not consist of vertical bars (vs. consists of vertical bars), plus it grows to a smaller adult size. It also possesses a unique fleshy structure on the lower lip which forms a continuous postlabial groove and sets it apart from all other Southeast Asian Puntius spp. It may eventually be placed in a different, as yet unnamed, genus and is excluded from the ‘P.‘ trifasciatus species group of which the other laterally-striped species mentioned here are members.